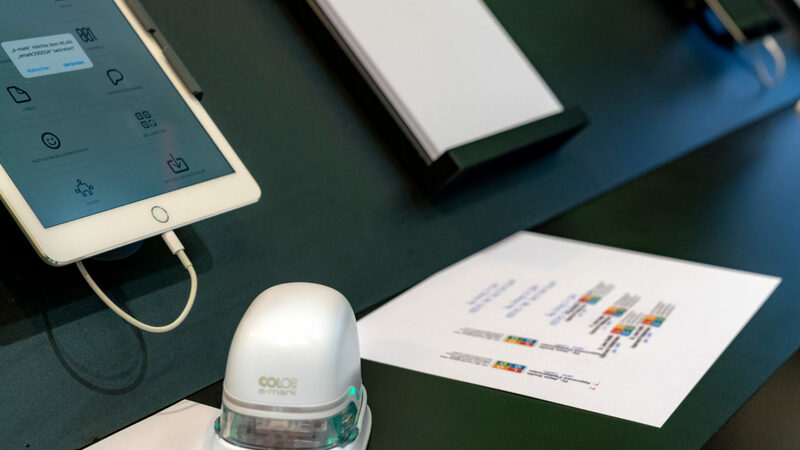 At this year's Paperworld in Frankfurt, we presented our new digital stamp, the COLOP e-mark®, a product that definitely deserves the term "world first". The high number of visitors and the great interest from the industry made our appearance at the fair a huge success! The approval of the visitors for the e-mark and the positive and enthusiastic feedback from experts and partners reinforces COLOP's expectation that the e-mark will be a great and sustainable success for us and our partners. With our innovative product the e-mark, we set a milestone in the field of stamping and made the step into digitalisation. In addition to the e-mark, the introduction of further electronic products is planned in the future. For the further development of digital and electronic marking products, we have founded a new company - the COLOP Digital GmbH. The e-mark is an electronic, mobile and battery powered marking device based on inkjet technology. Countless individual imprints can be created in an app, saved and transferred wirelessly via Wifi from a smartphone, tablet or via USB cable from a PC to the marking device. With a simple sideways movement, full-colour imprints can be applied on a wide range of materials such as paper, books, boxes, napkins, paper bags and even wood. The e-mark also works in offline mode where up to four imprints can be stored directly on the device. A variety of ready-to-use templates are available in the app – texts, images, company logos can be printed as well as barcodes or QR codes. In addition, the product offers a date, time and numbering function. Visitors to our stand were shown the various design options, had the opportunity to create their own imprint, and immediately make an imprint. Attention was drawn to a programmed robot that showed how imprints are made with the e-mark. Sales in Austria, Germany and Switzerland will start in the second quarter of 2019. Subsequently, the market launch will then take place in other European countries and the USA. The worldwide launch will be completed in the first quarter of 2020. During Paperworld the specially created website for the e-mark went online. On emark.colop.com, our customers and all interested parties can find detailed information about the e-mark, templates, as well as use case videos in a clear and attractive format. As part of Paperworld, of course extensions and supplements in the stamp range were presented. Outstanding is the addition of the very successful Pocket Stamp Plus variety with another size - the Pocket Stamp Plus 40. With an imprint size of 23 x 59 mm the pocket stamp will be available this year. The Paperworld 2019 initiates an exciting and extremely promising year with interesting, new products as well as new ideas and projects.